Drive demand for your products on Amazon. We help clients maximize the return on their Amazon advertising spend with managed campaigns that boost product discoverability. Amazon Advertising offers advertising for keyword- or product category-targeted ad campaigns. 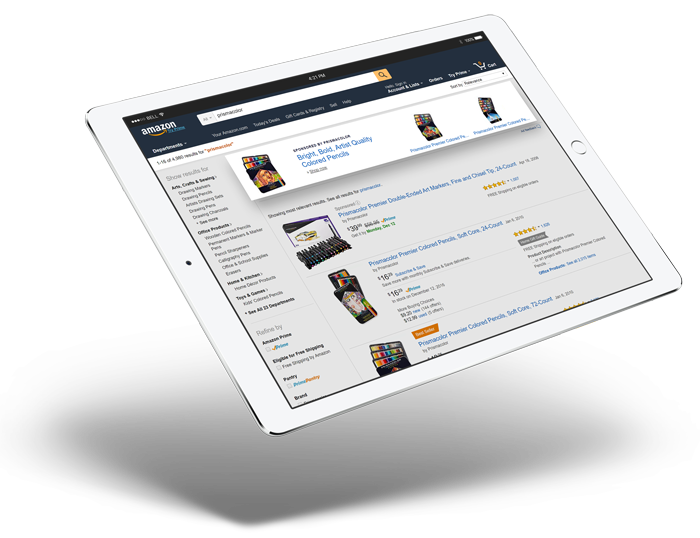 Available to nearly all vendor brands, Amazon Advertising helps drive demand for your products. Brands can register for search services (Sponsored Brands, Product Display Ads, Sponsored Products) for free; you pay only when shoppers click on ads. We strategically manage our clients’ Amazon advertising spend. We are pros at creating, optimizing, and reporting on ad campaigns. Our expertise includes sponsored products, sponsored brands, and product display ad campaigns. Our clients have increased their Amazon Advertising revenue by more than 700% when they’ve combined our Amazon Advertising management with our content services. Content26 maximizes the return on your Amazon Advertising investment, providing your team with actionable insights into your campaign performance and results. Additionally, our keyword-optimized product page content help ensure your products get discovered long after your campaigns end. At the crossroads of Amazon keywords and paid search, you’ll find dynamic content. Dynamic content maximizes the potential of your Amazon ad campaigns. Our Ecommerce Marketing team views each campaign as a strategic opportunity for your brand. Across all of our Amazon advertising campaigns, we’ve seen a 19% decrease in average cost per click and a 55% decrease in advertising cost of sales. In addition, we’ve seen a more than 2x increase in return on ad spend. In one test case, we compared two products with nearly identical prices and daily ad budgets. We found that the managed campaigns returned roughly 3x the revenue of the automated campaigns during the same time period. Not only did the managed campaigns return more revenue, but they also netted more impressions. The managed campaign ads were served to Amazon shoppers more than 10,000 times each day, compared to approximately 550 times each day for the automated campaign ads. If you’re looking to increase your Amazon sales, we can help. Over 50% of online product searches start on Amazon and brands can’t ignore advertising when developing their Amazon strategy. In this content26 ebook, we take a look at the evolution of Amazon Advertising, the different types of advertisements available, and how to get the most out of your Amazon Advertising campaigns. Amazon Advertising is a unique tool that allows us to promote our brands and products to Amazon customers. With Amazon ads, we can accelerate the sales rank of new product launches, defend against key competitors, and more effectively capitalize on marketing and promotional activities that are occurring with our brands.